Lexington, KY – Sixteen vaulters from around the U.S. visited the Kentucky Horse Park over the past weekend to compete in the CVI Kentucky and North American Young Riders Vaulting Challenge. CVIJ 2*, CVI 2*, and CVI 3* competitions were all held. In the 3* competition a familiar face finished atop the women’s division. Mary McCormick (Woodside, CA) scored 8.041 on the Sydney Frankel owned horse Palatine. It was a good finish for the pair as they prepare to head to Le Mans, France for the World Vaulting Championships August 13-19. The men’s individual event was won by world championship alternate George Joseph Gadd on Sydney Frankel’s Cheval. At the 2* it was Ruthann Goodrich (Wilmore, KY) on Cheval who bested Stephanie Harris (Chantilly, VA) to win the Female individual competition. The 2* event also featured a squad competition won by USA Pack on Bordeaux Imperial. USA Pack was made up of six vaulters representing four states and was coached by Lisa Zielenske. Woodside Vaulters (Courtesy of Woodside Vaulters). Denver, CO – More than 300 top equestrian vaulters in the United States came together this weekend at the National Western Complex in Denver, CO for the USEF/AVA National Championships – and they did not disappoint. The Woodside Vaulters of Woodside, CA, gained the top spot on the podium in the Team Championships. The A team consists of Katharine Wick, Gabe Aniello, Allysa Bonora, Tessa Divita, Kathryn Jaggers, Siddartha Kreaden, Katherine Salisbury. The team vaulted on Stanford, lunged by Julie Divita. The Woodside Vaulters continued to dominate with Patrick Stevens, the Men’s Individual National Champion, on Agado lunged by Julie Divita, and Giovanni lunged by Krista Mack. 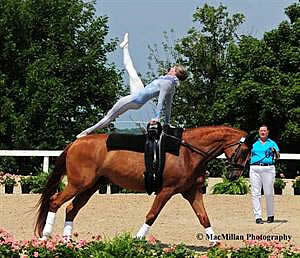 In 2007, Stevens was the USEF/AVA National Vaulting Champion in the Silver Men’s division, and in 2009 he was second. 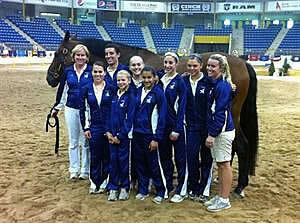 In 2010, Stevens finished sixth at the USEF/AVA National Vaulting Championships. For the second year in a row, the Women’s Individual National Champion was Mary McCormick, one of America’s most decorated vaulters. McCormick, of Mt. Eden Vaulters, Saratoga, CA, vaulted on Sir Anthony Van Dyck (aka “Spike”) lunged by Carolyn Bland. McCormick was named USEF Vaulter of the Year in 2007 and 2009. Next year, the AVA/USEF National Vaulting Championships will take place at the Alltech Arena at the Kentucky Horse Park in Lexington, KY, August 1-5, 2012. For more information about USEF Vaulting, visit: http://usef.org/_IFrames/breedsDisciplines/discipline/allVaulting.aspx.